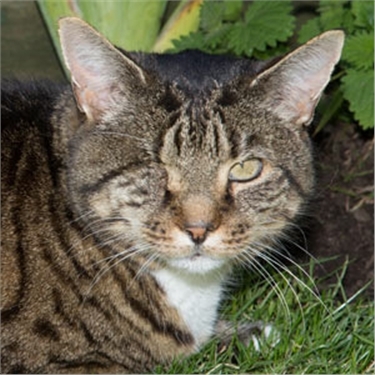 A one-eyed former stray who survived near-drowning and 15 years living rough has won top honour at Cats Protection’s National Cat Awards 2014 sponsored by PURINA®. Twenty-year-old Nelson was named overall National Cat of The Year after winning the Most Incredible Story category at an awards ceremony at The Savoy in London on 7 August. The plucky older gent has used up a fair share of his nine lives during an eventful life. Callously thrown into the sea in a sack with his littermates, he survived when a fisherman plucked him from the waves. Tough times followed as Nelson spent 15 years living rough on the docks at Seaham Harbour, County Durham, with only the shelter of a fisherman's cabin to protect him from the bitter elements. Having lost an eye, dodged dog attacks and endured a gang throwing rocks at him, Nelson was eventually scared away from his home when heavy machinery was brought in to start building work on a new marina. But he hit the jackpot in 2009 when the Huntley-Crow family, who had heard about his eventful life from fishermen, took pity on him and took him to to live at their home in nearby Seaton Village. In January this year Nelson was diagnosed with an inoperable heart tumour, but despite a bleak prognosis he has amazed vets with his zest for life. Nelson was chosen by a panel of celebrity judges including model Lucy Pinder, actress Lesley Joseph and newsreader Jan Leeming to win the title. Nelson’s owner Andrea Huntley-Crow said: “We used to visit the harbour and the fisherman would tell us all about his tough life. He had some shelter in the fisherman's cabin, but certainly none of the comforts of a home. Other celebrities attending the awards included Emmerdale star Eden Taylor-Draper, Republica singer Saffron Sprackling and Hollyoaks actress Carley Stenson. Nelson beat four other finalists to take the top prize – pub cat Legz, who has helped bring communities together; loyal Cleo, who stayed by her owner's side when he suffered a heart attack; caring puss Elias, who helps his owner break free from bouts of Post-Traumatic Stress Disorder; and Mr Chips, who has helped his owner cope with a serious medical condition. There was also a Special Recognition Award presented by Cats Protection's Chief Executive, Peter Hepburn, to Keith Smith, of Lytham St Annes, Lancashire, owner of loyal puss Holly. Holly is everything to Keith, for the most tragic of reasons. In 2012, he lost four of his grand-children - Reece, Holly, Ella and Jordan - in a house fire in Freckleton, Lancashire. Not long after this, his son also sadly passed away. Cats Protection is the UK’s leading feline welfare charity and helps over 194,000 cats each year through its national network of over 250 volunteer-run branches and 31 adoption centres. To adopt a cat, please visit www.cats.org.uk or call the charity’s national helpline on 03000 12 12 12. For further information, photographs or an interview, please contact Cats Protection’s Media Office on 01825 741 911, at media.office@cats.org.uk, or @CPMediaTeam on Twitter. 1. Cats Protection’s registered charity number is 203644 (England and Wales) and SC037711 (Scotland). 2. Founded as the Cats Protection League in 1927, the charity adopted the name Cats Protection in 1998. We ask that you use the name Cats Protection when referring to the charity in all published material.